Landslides are not unique to Earth, researchers revealed on Tuesday. In 2015, Europe’s Rosetta spacecraft witnessed — and photographed — a big one on the surface of a comet in deep, dark space, they reported in the journal Nature Astronomy. The cliffside collapse created about 2,000 tonnes of rubble, 99 per cent of which settled at the foot of the precipice. The rest was ejected in a spectacular jet of dust. In the first direct evidence for cometary landslides, Rosetta captured before and after images of a wall giving way along a crack 70 metres (230 feet) long and one metre wide on the edge of a cliff named Aswan. Scientists were alerted to the possible collapse in July 2015 by a large plume of dust ejected from comet 67P/Churyumov-Gerasimenko, which Rosetta was orbiting at the time. They traced the jet’s origins to Aswan. Five days later, the orbiter’s OSIRIS camera observed a “fresh, sharp and bright” edge on the Aswan cliff, where the fracture had been before. The spot — six times brighter than the comet’s usual, dusty surface — was the newly-exposed, pristine, icy insides of the comet. The Rosetta mission had observed several previous outbursts, and hypothesised they may be the result of collapsing cliffs. 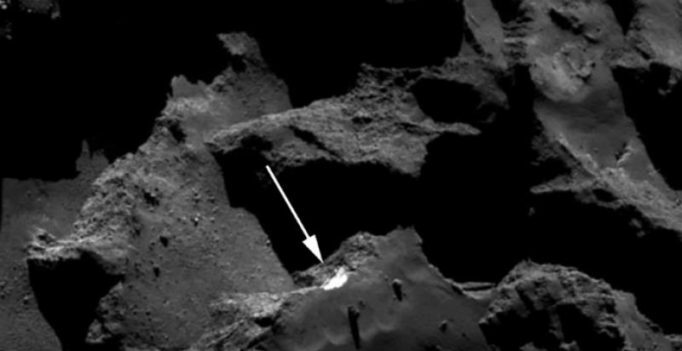 But the study documents “the first unambiguous link between an outburst and a cliff collapse on a comet,” the team wrote. Launched in 2004, the European Space Agency’s Rosetta spacecraft travelled more than six billion kilometres to reach comet 67P some 400 million kilometres (250 million miles) from Earth. In November 2014, Rosetta released a tiny robot named Philae onto the comet’s surface to further probe the alien body. The pair’s mission was to unravel the mysteries of life by investigating the comet from all angles. Billions of comets travelling in elliptic orbits around the Sun are believed to be leftovers from the birth of our planetary system some 4.6 billion years ago. On 67P, the Rosetta mission uncovered organic molecules, the building blocks of life. This supported the theory that comets helped spark life on Earth by delivering organic materials when they slammed into our young planet. Water, on the other hand, was unlikely to have come from comets of 67P’s type, the mission concluded.